SKY MAP: The view toward the southwest at 3:58 a.m. local time from some mid-northern latitudes, moments before Antares is blocked by the Moon. The view will be slightly different from each location, however. Back on March 3, the Moon crossed in front of the bright red star Antares for much of North America, an event called an occultation. 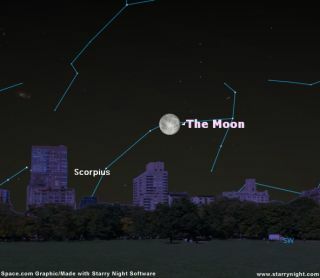 If you missed the event, you'll have another opportunity to see the Moon hide this star early Tuesday, May 24. As was the case back in March, the upcoming occultation will be chiefly an after-midnight affair. Once again, western observers will be favored. Along the West Coast, Antares will disappear behind the Moon right around midnight and will emerge about an hour later. Best views will be over the southwestern states where Antares will disappear and reappear near the time when it will be at its highest above the southern horizon. Farther east, the occultation will take place later into the night. Easterners will have to make sure their alarm clocks are set for around 4 a.m. Shortly thereafter, Antares will vanish behind the Moon. When the ruddy star is ready to emerge about an hour later, morning twilight will be lighting up the sky for the Middle Atlantic and Northeastern States, with the Moon hanging very low to the southwest horizon. So it is wise to make sure there are no obstructions, like trees or buildings in that direction that might otherwise hide your view of the Moon and reappearing star. Unlike in March when the Moon was at Last Quarter ('half') phase, this time the Moon is going to be virtually full. In fact, the Moon officially turns full about 12 hours before the occultation. So technically, it will be a waning gibbous Moon that will cover Antares, but 99.7% of its disk will still be illuminated! So brilliant will be the Moon, that in order to see both the disappearance and reappearance of Antares, you will need to use at least good binoculars, if not a small telescope. Some hours before the occultation, you'll likely be able to see Antares with your unaided eyes lying just off to the east (left) of the bright Moon. As time passes, the Moon will gradually creep toward the star at roughly its own apparent diameter per hour. Within an hour of Antares vanishing act, the Moon's brilliance may overwhelm the star, making it necessary to use optical aid. The same will hold true for its reappearance, especially in those areas where dawn twilight has already begun. In the table below, we provide a timetable for 19 selected locations, giving the local times and the Moon's altitude for both Antares' disappearance and reappearance. A single asterisk (*) means the event occurs during morning twilight. From Boston and Montreal, the reappearance of Antares occurs after moonset. For Los Angeles, San Francisco, Seattle and Vancouver, the disappearance occurs on the calendar date of Monday, May 23. The information is based on predictions by the International Occultation Timers Association (IOTA) and has been rounded off to the nearest minute. More detailed information, including maps of the occultation zone, as well as times for more than 275 cities in North America, are available here.